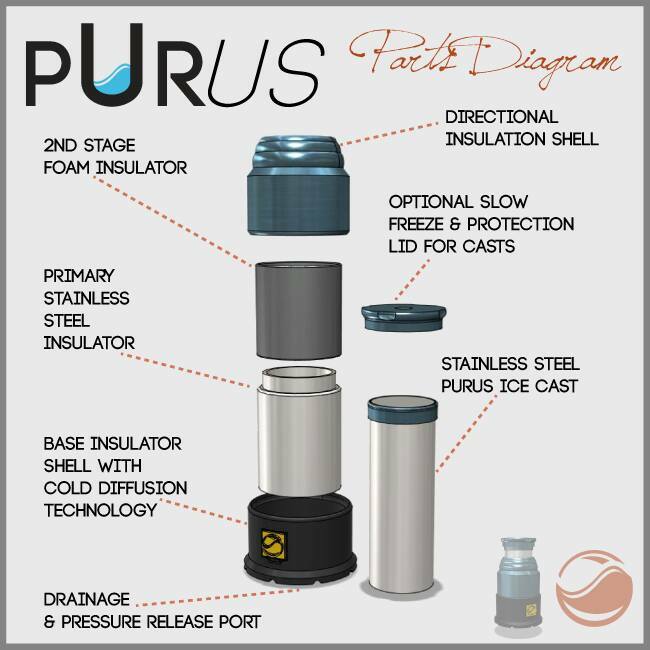 I received the Purus system a couple of days ago. I unpacked it. My initial thought was that it looked cheaply made due to the 3d printed parts and It was a bit bigger than the homemade ice ball casts I have been using. I couldn’t wait to try it. I washed it as per the instructions. (Like one needs to be told that). Having had the best luck with Costco (Kirkland) bottled water in my homemade casts, I used it for the first one. I filled the cylinder to about ½ inch from the top and inserted it into the base all the way. I froze it for about 12 hours. I took it out. It was barely frozen big enough for an ice ball. IT WAS TOTALLY CRYSTAL CLEAR. Wow. I was impressed. The second one, I used cold tap water. I filled it to the same level, inserted it all the way. I let if freeze for about 22 hours. It froze about 80%. STILL CRYSTAL CLEAR. The 3rd time, I filled the cylinder with cold tap water and only inserted it into the base about 2/3 of the way. I let it freeze for about 14 hours. It froze to an ice ball size blank. And STILL CRYSTAL CLEAR. This is a PERFECT means for CRYSTAL CLEAR ICE. I’m so impressed with it. I love it. Rating? 5 of 5 stars, 10 of 10 stars. You get the picture. I will recommend this to EVERYONE!